It was Prince Philip who broke the news to the then Princess Elizabeth of the premature death of her father George VI on February 6 1952, while they were on a Commonwealth tour. Only six days earlier the King, with his wife Queen Elizabeth, and younger daughter Princess Margaret, stood in bitter cold on the tarmac of London Airport, to wave Princess Elizabeth and her husband off on the first leg of their journey, to Nairobi. Illness was etched on the King's face, and his subjects were shocked by the pictures that appeared in the newspapers the next day. The Princess, not knowing what cards fate was dealing for her, probably became Queen while filming wildlife from the observation post known as Treetops, overlooking a waterhole in the Aberdare Forest game reserve, in Kenya, 3000 miles from frost-shrouded Sandringham House back in Britain where her much loved father had died in his sleep. The new Queen's return to London the following day, was captured in one of the most poignant photographs of her reign. The picture showed her alone, young, almost vulnerable and dressed in deepest mourning, descending the steps of a BOAC Stratocruiser, to be met at the bottom by her Prime Minister, Winston Churchill and the country's senior politicians, a line of elderly men, clad in raven black, their bare heads bowed in respect. She was crowned, officially, as Queen Elizabeth II on 2 June 1953 at Westminster Abbey. Five years earlier, on the occasion of her 21st birthday, during an official visit to South Africa with her parents, the Queen pledged a lifetime of devotion to the service of her people. It has been a promise well kept. Through decades of social change, Queen Elizabeth II is incontrovertibly the consummate master of her role. This is all in the line of normal duties for the Queen who is the most traveled monarch in the world. She has been received in almost every nation of significance, and in many of the map's microscopic dots. She is greeted with affection and instant recognition wherever she goes. The two million people who thronged the Bund of Shanghai, during her visit to China in 1986,knew exactly who she was, "The English country female King," as they described her. To foreigners, the Queen represents something rare and desirable. Her throne is by far the best known of a diminishing collection, and the stability it represents in a deeply uncertain and fast changing world is the object of a wider envy than is sometimes realised in Britain. Appreciating its virtue does not require understanding of the intricacies of constitutional monarchy. It transcends politics, and even nationality; how often, on a distant curbside, do waiting admirers announce that they have come to see not the Queen of the United Kingdom of Great Britain and Northern Ireland, of her Other Realms and Territories. . .but simply THE QUEEN. She is particularly feted in the United States and France, for instance, countries which pioneered the overthrow of monarchy in favour of what they believed to be the true democracy of republicanism. In recent years, her travels have been even more high profile than those of the past. 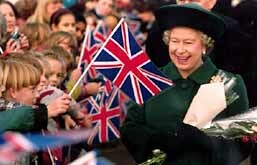 In October 1994 she made her long awaited State Visit to Russia; once again she made history as the first reigning British monarch ever to set foot on Russian soil. Overseas visits vary in length, and now tend to be much shorter. There will never again be anything like the six month Coronation Tour of 1953-54, when the Queen and Prince Philip embarked on a marathon which took them to Sri Lanka, Australia, New Zealand, Bermuda, Jamaica, Fiji, Tonga, Malta and Gibraltar. The schedule was so energetic that the Queen lost quite a few pounds in weight and a number of her outfits, which had become too loose, had to be altered en route. On the way home, Tobruk was chosen as the point at which the Queen took delivery of her new royal yacht, Britannia, with her elder two children, Prince Charles, now the Prince of Wales, and Princess Anne, now the Princess Royal (then just five and three, respectively) already on board. 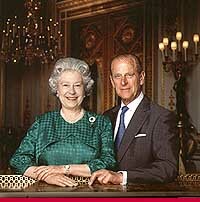 It was the longest time that the Queen and Prince Philip had been separated from their children, and they were so taken up with the family reunion that it was more than an hour before they were ready for a conducted tour of the ship which was to become the famous "floating palace" for many, many more future tours to all parts of the world. Much of the Queen's traveling is to Commonwealth countries. She takes her role as Head of the Commonwealth extremely seriously, and is always present in the host country for the biannual Commonwealth Heads of Government Meeting. She plays no part in the sessions of the meeting, but does exercise immense behind the scenes influence, receiving in private audience all the Commonwealth prime ministers. Of all sorts of different political persuasions they are united in one thing: that they can trust her impartial judgment. No-one can say that the Queen has not been assiduous in carrying out her duties, and retirement is not an option. Her red boxes of state papers follow her everywhere, even on holiday, and very often the last light seen burning at night in Buckingham Palace is that in the Queen's apartment as she works on them. She has been served by nine Prime Ministers, and because of the length of her reign, she is a greater repository of accumulated experience than most of them. Although previous Prime Ministers have been properly discreet in their memoirs about what was discussed at their weekly audiences, they have indicated clearly enough the value and relief of being able to bounce their innermost worries off a knowledgeable but neutral referee. Prime Ministers of both major parties have praised the Queen's shrewdness, wit and impartiality, and have welcomed her as a sounding board and reliable source of the long view when the going has been especially tough. In the hugely successful BBC Television documentary, Elizabeth R, which marked the 40th anniversary of her accession, the Queen explained how her Prime Ministers had used her as a sponge" to absorb their political burdens. "Occasionally one can put one's point of view when perhaps they had not seen it from that angle," she remarked. Throughout the film, which charted her working life over 12 months, the Queen belied her rather reserved public persona to reveal a talent for the droll. It was peppered with her well timed witticisms and comic pauses, whether holding court with world leaders or discussing events with her Private Secretaries. The Queen's hold on the affections of the majority of her subjects has never really faltered. Throughout her reign she has kept a level head, with loyalty and service as her priorities. Through millions of photographs and tantalizing filmed glimpses, her people see a trusted, familiar figure, an ordinary, down-to-earth woman, but one doing an extraordinary job. In a fast moving world, reference points for certainty are becoming fewer, but the Queen is undoubtedly one of them. At a time when monarchies are not in fashion she has preserved Britain's own particular brand for future generations by adroitly adapting and modernising the institution to the times. Adapted from an article by Tom Corby, former Court correspondent, Press Association, London.